I was correct, but he also have an awesome factor that is pretty sweet. 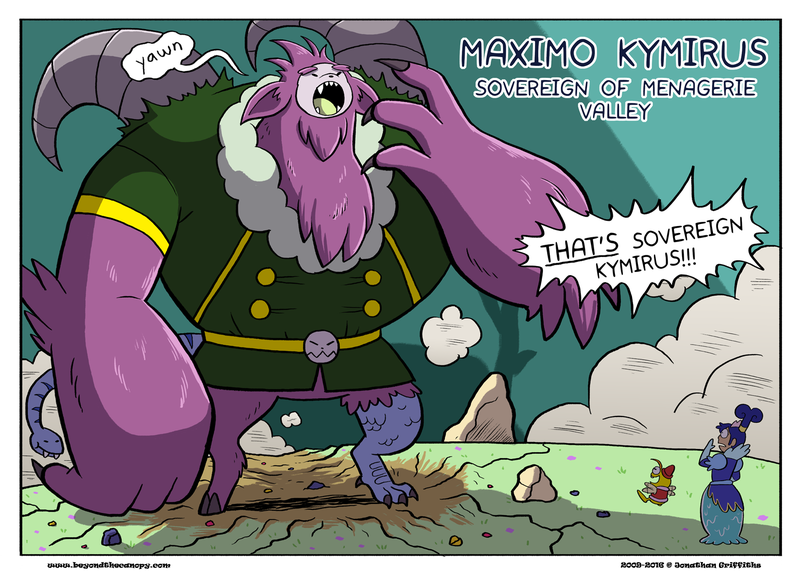 Oh, Kymirus, chimera. I get it. Yeesh. Guy must go through shirts like toilet paper. I like his weird back horns. They look neat. Are ANY of the Sovereigns diplomatic at all? So far we have one who might be when she’s not just interacting with old friends, one who likely couldn’t sit still for any length of time that isn’t best measured in Planck seconds, a guy who crashed into the castle and seems only half-awake, and Redwood. Though I guess Kymirus gets something of a pass for having just had a long flight. Moana is pretty diplomatic, she just hasn’t seen Redwood in forever. So there’s one.